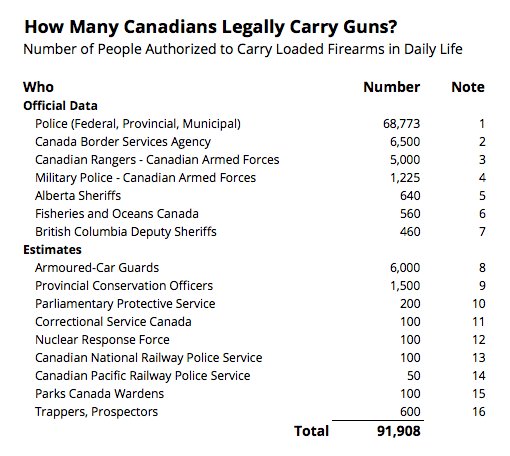 More than 90,000 Canadians are authorized to carry loaded guns on their person in daily life, mainly for self-defence against human attackers. More than 90 percent are civilian police and law enforcement, or military. If they were all on duty at the same time, it would be equivalent to about 3 people carrying guns for every 1,000 adults. I find it odd when people say that the presence of guns is a threat to life. Not a loaded firearm aimed at them by someone squeezing the trigger or threatening to do so, but the mere proximity of a gun, like being in the same area as one. Guns are all around us, all the time. On farms, in the bush and in cities. Most are unloaded and locked up. Millions of Canadians are allowed to use our more than 10 million firearms for hunting, sport, pleasure, collecting and other legitimate, healthy activities. We put effort into using them responsibly, skillfully and safely. At any given moment, tens of thousands of Canadians have loaded and unloaded guns in our hands or nearby: in a holster on a hip, at home, at target ranges, while hunting, in the cab or trunk of a car, or in the tractor, truck or ATV on the farm or in the bush. (Tens of thousands of hunters are probably out today with loaded shotguns for the first weekend of turkey season in many areas across the country.) Factories, warehouses and shops store tens of thousands of firearms. And many people (hundreds? thousands? tens of thousands?) carry without authorization. The table shows the number of people at different organizations who are authorized to carry on their person every day. Most of the data come from public documents or from the organizations. Some organizations didn’t respond or refused to provide data when contacted by TheGunBlog.ca. When reliable information was unavailable, estimates are provided, and these aim to be underestimates. Some organizations probably got left out. If you have information (facts, anecdotes, context …), please contact me. Being authorized to carry a firearm means permission to have it on your person, generally a loaded handgun in a belt holster. Police, law enforcement and military have different rules than private civilians, who require an Authorization To Carry, which is different than an Authorization To Transport. Being authorized doesn’t necessarily mean you’re carrying. You might have stored your gun while at the office or the gym, or while off duty. Canadian Rangers are included because they are authorized to be armed, even though they are issued rifles whose readiness for use may be different than a pistol on a belt. An unknown number of people carry firearms without permission: “Bad Guys” who intend to harm, and “Good Guys” (including off-duty police) who carry as a last-resort defence against Bad Guys. Reliable estimates for these numbers weren’t available. Natural Resources Canada was excluded. NRCan said it temporarily issues field workers about 40-50 firearms per year for defence against wildlife. Some organizations don’t carry: Canada Security Intelligence Service (in Canada), Canadian Coast Guard, Immigration and Citizenship, Canada Revenue Agency. Thank you for input to Dennis Young, many people on CanadianGunNutz and a few anonymous others who contacted me. Canadian Rangers: Equipped with rifle. B.C. Deputy Sheriffs: Phone call. Parliamentary Protective Service: Estimate, total 400, but some are counted under RCMP. Corrections: Estimate, based on e-mail and anecdotal info. Authorization to carry depends on post. Officers carry when escorting prisoners to court, hospital, funerals, etc. Nuclear: Estimate. Each facility has its own Nuclear Response Force.